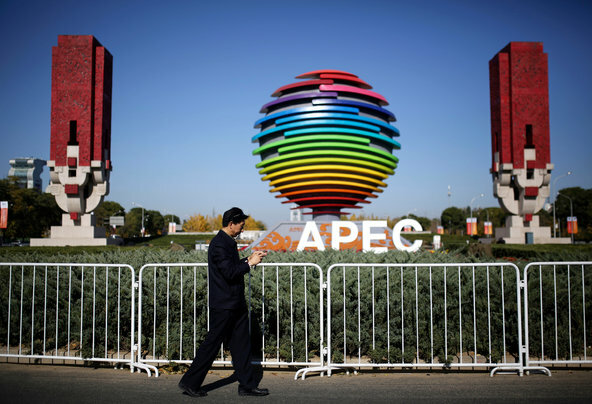 The air quality in Beijing during and for a few days after the Asia-Pacific Economic Cooperation (APEC) forum remained satisfactory. The arrival of world leaders meant an all-out effort to curb pollution, with factories temporarily shut down, limited vehicles on the road and workers sent on temporary leave. Residents of the pollution-prone capital called it “APEC blue.” It was a lovely respite for a city facing sometimes hazardous levels of air pollution. Despite the improved air quality outside, many places inside the city presented another harmful air issue. Smoking in enclosed public spaces is permitted at restaurants, hotels, offices and homes across Beijing. During the APEC meeting, the air outside was probably healthier than the air in many places indoors. Beijing now has another chance to show the world that it can lead by making all indoor public places smoke-free. At the end of November, Beijing’s lawmakers will consider the final draft of a new law to mandate that all indoor places become smoke-free. This is a unique opportunity to bring the “APEC blue” clean air to all indoor public places in the city, permanently. Having clean air indoors is a basic right that all the citizens of Beijing deserve. This is critically important, because outdoor air pollution caused by carbon emissions from factories and cars is not the only kind of air pollution which causes illness and death. Indoor air pollution caused by secondhand tobacco smoke is also lethal. In China, it is estimated that exposure to secondhand smoke kills more than 100,000 people every year. Reduction of outdoor air pollution requires substantial structural changes to the infrastructure of Beijing, and will take time. Cleaning the air indoors can happen now, and doesn’t require massive investments. It just requires the creation and implementation of smart laws to eradicate this health hazard. Consider this the next time you pull on a face mask to go outside when the pollution reading in Beijing is high. Breathing in Beijing’s air on even the most polluted day is not as bad for you as being inside a restaurant, hotel, office, or bar where other people are smoking tobacco. Secondhand smoke affects the health of everyone inside, from workers to guests, the elderly and children. There is no safe level of exposure to secondhand smoke. The only way to protect against the very serious health hazards caused by exposure to secondhand smoke is through entirely smoke-free environments, with no loopholes and no exceptions. Beijing lawmakers are now finalizing a law to make Beijing’s public places smoke-free. They have an opportunity to make Beijing the first 100 percent smoke-free city in China. In October, I was extremely pleased to learn that a proposed loophole in the Beijing smoke-free law on individual offices had been removed from the draft law. That was very good news indeed. But my pleasure on hearing this was matched by serious disappointment on learning about exemptions to the law which are now proposed for hotels and airports. The provisions for hotels in the current draft of the law are weak. It is not good enough to say in a law that hotels “should” be smoke-free. They must be 100 percent smoke-free to protect their guests, as well as their staff, from exposure to secondhand smoke. Without such measures, China will pay a very high price in the lives of its own people. Strengthening this law, to make Beijing 100 percent smoke-free, is not only in line with the legal commitments China has made by signing the WHO Framework Convention on Tobacco Control, it will save lives. This article also appeared in the Opinion Pages of Global Times.